Contact us to ask your question! Unbiased reporting of state-of-the-art gluten-free food testing data for consumers! Subscribe today and get the full text of all reports, and 8 new reports per month. Detailed reports of the gluten content of the selected products. In addition to the test results we provide other information including ingredients list, "Contains" statement, may contain statement, and how "gluten-free" is stated on product packaging. Gluten-free Watchdog is a fast, reliable and inexpensive way to see how "gluten-free" the foods we recommend really are. I highly recommend it. Some of the foods tested are NOT tested by the company that sells them. We need more sponsors so that more and more foods can be tested. The late Suzanne SimpsonRegistered DietitianDietitians: See information about the Suzanne Simpson Subscriptions program for your patients with both CD and type 1 DM. Wow, Tricia! This site is wicked cool! I have a feeling people are really going to like this. I am loving the site. I am a working mother of 2 (under the age of 3) so I love the quick things I can make for dinner. We love the Ancient Harvest pasta and the Thai Kitchen soups - so I am thrilled to see the results from those tests. 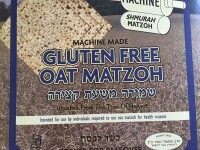 Thanks for providing this resource to the gluten free community.